Please click on the small horizontal bars at the top of this page to see photos, watch videos, learn where to donate, or sign the guestbook. Watch the entire 1 1/2 hour memorial here. The Santa Monica pianist and teacher, Saralee Konigsberg Halprin, has died at age 92. Please click on the small horizontal bars at the top of this page to see photos, watch videos, learn where to donate, or sign the guestbook. Mrs. Halprin, known for her clean technique and bright sound, began playing the piano at the age of four when she imitated what her mother’s singing group sang in their Cleveland home. A frequent winner of musical competitions, she studied with private teachers who offered her scholarships, and attended both the Longy School of Music in Boston and The Juilliard School in New York City on full scholarships. At the age of 21 she was the pianist with the Cleveland Symphony Orchestra under Erich Leinsdorf, George Szell and Fritz Reiner. In 1946 she joined her family in Los Angeles, and won the 1948 Hollywood Bowl Auditions of the Air, a national yearlong radio competition, for which she was awarded a performance with the Los Angeles Philharmonic. It was in Los Angeles that she met her husband Leahn Joshua Halprin, a farmer and artist from Yuba City, whose family started the Pacific Coast Textile Company in Los Angeles to support the farm during the Great Depression. They spent time in both communities until Mr. Halprin’s death in 1976. In addition to her work as a solo pianist, she performed with cellists Harold Schneir, and George Neikrug, as well as violinist Jerome Kasin. She grew up playing with and accompanying violinist Sidney Harth, concertmaster, conductor and soloist of international orchestras. She was a member of the Pacifica Piano Quartet for ten years. Affiliated with Young Audiences, they performed programs throughout the Los Angeles area. Until 2009, Mrs. Halprin was part of the SaDoMa Trio with Martine Verhoeven and Donald Howarth; they performed for and conducted chamber music classes for Brandeis University Women for 14 years. 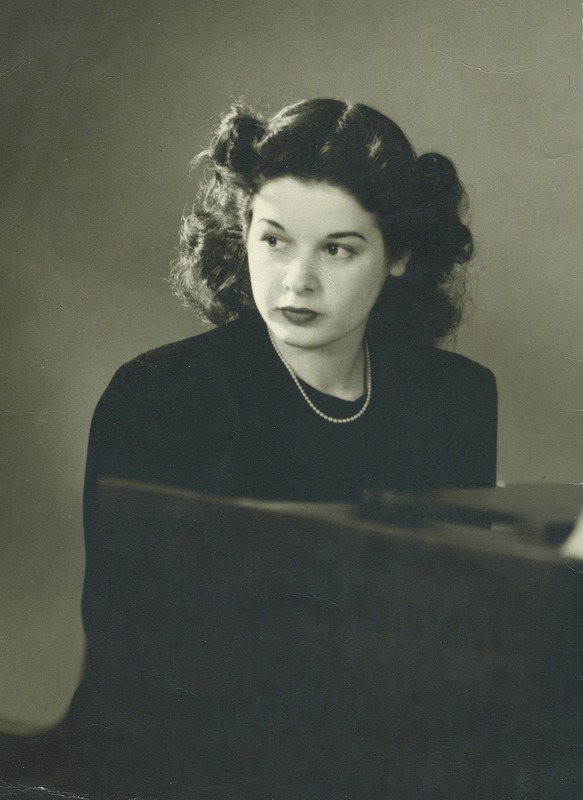 She also performed four-hand piano works with Sidney Stafford for 25 years, and two-piano concerts with Xenia Chasman. Her favorite composers included Mozart, Beethoven, Bizet, Schubert, Schumann, Chopin, and Dvorak, and in her last years she was delighted to learn many of Beethoven’s 32 piano sonatas. An enthusiastic teacher as well as performer, she taught in her Santa Monica home until her death. Mrs. Halprin and her husband were devoted to progressive causes; she often performed benefit concerts for peace organizations and to support Another Mother for Peace, Daniel Ellsberg, and progressive political candidates. Mrs. Halprin was one of ten children; her oldest brother Raphael Konigsberg was a Los Angeles lawyer and activist barred from practicing law for refusing to take a loyalty oath during the McCarthy Era. The U.S. Supreme Court reinstated his law license in 1978. Mrs. Halprin was also an active volunteer in the Santa Monica area at the Santa Monica Library Book Store until shortly before her death, and at Santa Monica public radio station KCRW, Hosteling International, and Santa Monica Hospital for many years. Mrs. Halprin was an avid walker and participated in YWCA exercise classes for 40 years. She loved beauty, and enjoyed filling her home with flowers. She is survived by her daughters April Halprin Wayland and her husband Gary of Manhattan Beach; Lyra Halprin and her husband Alan Jackson of Davis, Calif.; and grandchildren Joshua Halprin Jackson (Shelby Ho) of Honolulu, Julia Halprin Jackson (Ryan Alpers) of San Jose, and Jeff Wayland of Northern California; brothers David Konigsberg of Los Angeles and Charles Konigsberg of Bellevue, Wash.; and numerous nieces and nephews. A celebration of Mrs. Halprin’s life took place in early 2015. If you’re interested in honoring her memory, contributions may be made to the Los Angeles Museum of the Holocaust, the Juvenile Diabetes Research Foundation, or the Southern Poverty Law Center. This website is living memorial to Saralee’s life, not only as an accomplished musician, but as as a mother, grandmother, sister, aunt, cousin, and friend. To contribute memories to this site, please visit our guestbook or email rememberingsaralee@gmail.com. We also invite you to visit our Photos and Videos pages to learn more about Saralee’s life. i knew saralee because we were both volunteers in the earlier days at kcrw…saralee hosted wonderful parties at her beautiful santa monica home, for kcrw workers, and it was always a warm and generous environment…i still stay in touch with some of the kcrw community. Saralee was my first mentor at the Santa Monica Library Bookstore, where we were both volunteers. She had such beautiful eyes and a great smile – she was always welcoming and very generous with her time. A very gentle soul whose bright light and spirit remains for all of us to remember. She was an example of a life well-lived.